Illustrated above is a small selection of the work we will be putting on eBay in the next few weeks. We are planning to start off slowly and see how it goes. We will be including complete and part services from our Sovereign, Nursery, Jubilee, Blue and White and Willow ranges later in the year now that I have completed filling the backlog of orders for them. We will not be taking new orders for these pieces but will list them as and when I can make them. 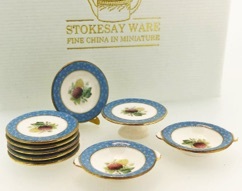 Search eBay for 'Stokesay Ware' to find us, or our seller ID stokesayarchive. Save the searches within eBay to receive notifications of new listings so you won't miss anything. In the meantime all the work illustrated in the left hand column of our website is available to order now, namely the Victorian kitchenware and the Chelsea plates. I also plan to make some new services using the Chelsea patterns. I won't be able to take orders for these but will offer them for sale at shows and on Ebay for those not able to attend. Chrysanthemum dessert service based on Chelsea 144.